This gluten-free and dairy-free three-bean vegetarian chili will warm you up and nourish you from the inside out throughout the cold days of winter! When the temps are in the 30s or below, soups, stews, and chilis are what I crave and this Three-Bean Vegetarian chili is one of my favorite winter recipes to cook up for my family. It’s also a great meal to make for gatherings with friends, especially when you have a crowd together watching weekend football. The more you reheat it, the better it gets. This works great for me since I love leftovers! It’s chock-full of good-for-you stuff: vitamin C-rich vegetables like peppers and tomatoes, protein- and fiber-rich beans, and antioxidant-rich herbs and spices. 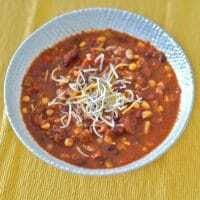 Most of the ingredients are pantry and freezer staples – beans, broth, crushed and diced tomatoes, and dried herbs and spices. It’s a one-pot meal that you can make ahead and is super freezer friendly. Need I say more?! It’s a meal the whole family can – and will – enjoy! It can be make mealtime fun and interactive. As I mentioned above under the reasons I love chili, this three-bean vegetarian chili is packed with so much nutrition and flavor. Multi-colored bell peppers, onions, garlic, crushed tomatoes, corn, herbs and spices, and of course all those beans provide vitamin C, lycopene, fiber, and plant-based protein. This is definitely a satiating dish you can feel good about eating, even if you go back for seconds! You may be surprised by some of the ingredients I add to my chili. Apple cider vinegar and maple syrup are not found in every chili recipe out there, but I love the added tang and sweetness these two ingredients provide. There is some hands-on prep involved, but it’s not a crazy amount, and once you get the veggies sautéed it’s really just a matter of adding the rest of the ingredients and having patience for the chili to be done cooking. A great thing about chili is you can’t overcook it. So set it on a medium-low flame and keep it simmering while you go off to set up the chili bar, put together a few other appetizers for football watching, and maybe even get in some of the game (or some wine if you’re like me and football watching is more about the food than the sport!). While the cook time in the recipe below is 30 minutes covered and 30 to 45 minutes uncovered, keep in mind that these times can vary depending on how high your flame is, how much liquid comes out of your vegetables, and personal preferences for thickness of chili. Sometimes I have to cook mine longer to get a thicker consistency. I also occasionally use my immersion blender to blend some of ingredients in the pot, which adds to the thickness. This gluten-free and dairy-free Three-Bean Vegetarian Chili is filled with protein- and fiber-rich beans, vitamin C-rich vegetables, and antioxidant-rich herbs and spices. It will warm you up and nourish you throughout the cold days of winter. Heat the oil in a large soup pot over medium-high heat. Add the garlic, onion, and peppers and sauté until softened, about 3 to 4 minutes. Add the cumin, chili powder, cayenne, and oregano and cook, stirring, for 30 seconds to 1 minute. Stir in the crushed tomatoes, chopped tomatoes, broth, and water and bring to a boil. Reduce heat to medium-low, cover, and cook, stirring from time to time, for 30 minutes. Stir in the beans, corn, apple cider vinegar, and maple syrup, and continue cooking uncovered for 30 to 45 minutes more until the chili is nicely thickened. Season with salt and pepper and serve. 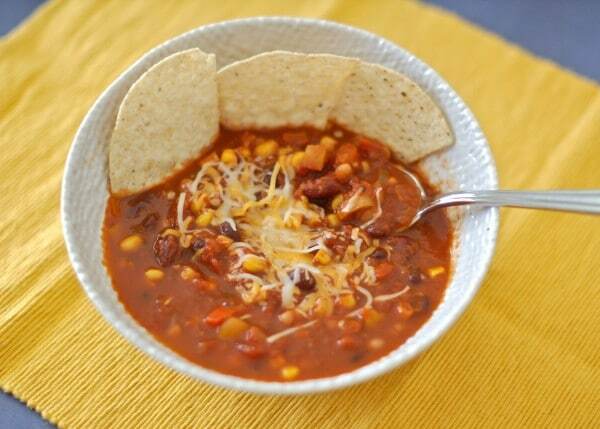 Do you love chili during the cold winter months? Bring on all the chili! It is one of my favorite things to eat during the winter. And I love that you included three different types of beans. Thanks Amy – I love the variety and how all the different beans bulk up the chili! Everyone in my family likes veggie chili too – although the hubs likes with meat better! I agree I love how low the sodium is in these stocks! Oh, I can relate Serena! 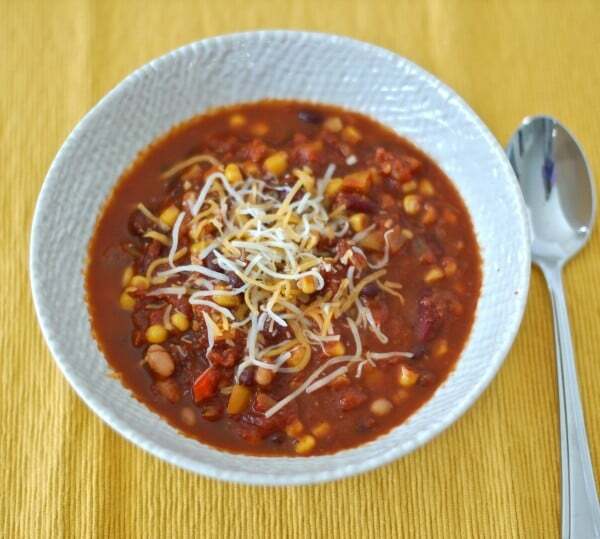 My husband likes everything better with meat, but he also loves adding cheese to the chili, so having veggie chili allows him to do that in our kosher home! One of my favorite things about chili is how it gets better each time you warm it up! This recipe looks delicious and perfect for those cold winter days. Yes! Isn’t that the best part of soups and stews?! Enjoy! #power to the #pulses for sure! I love this Jessica- such a hearty, healthy and super comforting recipe. I learned something new, I didn’t know you kept kosher! That’s so interesting- when I worked for UCSD I had a lot of kosher students I worked with so we could support their lifestyle in dining. I loved the eye opening experience it was for me! Cheers to superbowl healthy recipes-#yum! Thanks so much Liz! Oh, how cool that you learned a lot about kosher and were able to help the kosher students in the dining hall!! This looks right up my alley! I love the addition of maple syrup, I bet it adds such a good flavor and I never would have thought to do it! Thanks Kim! The maple syrup was a last minute addition, but added just the right finishing touch! yay! So happy for you! Bring on the chili! Wow, this isn’t a boring chili recipe! So many flavors. I had no idea Progresso had stock – I’ll have to keep an eye out. Thanks Alisa – boring isn’t in my culinary repertoire 😉 Yes – check it out! I love chili and this one looks so flavorful! BEST CHILI IVE PUT IN MY HEADHOLE !!! Haha..i’m glad you enjoyed it! I’m pretty much always craving chili! Can’t wait to try this delicious recipe out. Love hearing that. Let me know how you like it! 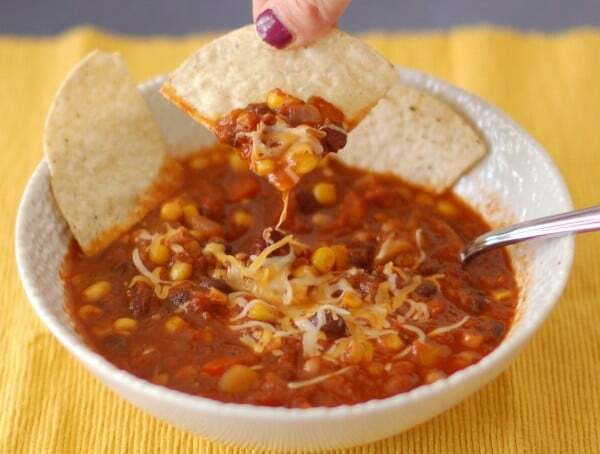 This vegetarian chili looks so amazing! Bet it would be delicious in a homemade sourdough bread bowl! Perfect for the Super Bowl! Thanks Jessica. That sounds like a delicious idea! Enjoy. I love chili this time of year! This recipe looks amazing I like all the different kinds of beans you added! I usually stick to black beans so I need to try adding more variety! This would make an incredible chili for a cold day! i love chili in the winter! The vinegar and maple syrup is seriously a different twist! I love vegetarian chili just as much as the traditional one. This looks so hearty and delicious…perfect for a chilly day like today. Your chili looks so incredibly tasty! I love that you mentioned the crumbles from Morning Star; it’s my secret weapon to add to recipes when I don’t want to eat meat and need to add protein to my diet. Trying this for sure! What a delicious chili! I’m such a fan of vegetarian chili this time of year. I have to try yours! I love chili any time of year! But yes especially when the weather is cooler. This chili looks delish! Agree with you Sonali. Hope you enjoy! I’d never thought about chili as “fun,” but I have loved it since I was a little kid! Such a versatile dish, too. Oh, I totally think it can be fun when you have all the toppings! So glad you love it! This recipe was awesome! It tasted amazing and seems to have kicked my boyfriends cold. We’re actually calling it “the cold kicker”, thank you so much for making and sharing! Absolutely will be making again. I am so glad to hear you and your boyfriend enjoyed the recipe and that it’s now your official cold kicker! Enjoy!